Registrations for Session IV begins February 27th. Introduction to movement and music for 18-24 months. This is a parent participation class. 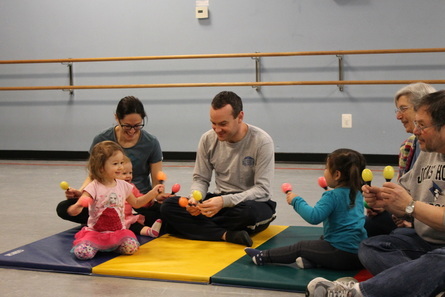 Dancers will explore dance and music using props to inspire creativity and aid in the development of coordination, locomotor, listening, and social skills. Creative movement for two year olds. The perfect introduction to dance for both girls and boys. They will have fun while working on coordination, locomotor skills, and creativity with use of bean bags, scarves, sticks, and much more! Dancers will work on listening skills, basic dance classroom etiquette, taking turns, and following directions. Little Movers is WITHOUT parent participation and Movin' with Me is WITH parent participation. A continuation of our Little Movers program. This class introduces ballet technique to aspiring young dancers. Begins Jan 2019. ​Acro dancers will learn how to develop their flexibility and strength, while learning some exciting Acro tricks. Acro skills include rolls, bridges, handstands, cartwheels, and backbends.